How long does pregnancy in the dog last? Pregnancy, also called the gestation period, normally ranges from 57-65 days with an average of 63 days. With a planned breeding, you should record the date of mating. If there are two matings, make a note of the exact dates and expect birth to occur between 63 and 65 days later. Immediately after my female dog has been mated, is there anything I should do? Make sure that she does not have the opportunity to mate with any other dogs. Remember that estrus or "heat" will continue for several more days and she could theoretically become pregnant from another dog during this period. After a planned mating, it is a good idea to allow her to rest quietly for a few hours. It is important that she be in good physical condition before she is mated. Both the male and female dog should be examined by a veterinarian prior to mating. "Discuss nutritional supplements and vitamins with your veterinarianbefore giving them to your dog." After mating, food intake should remain the same during the first two-thirds of pregnancy (approximately six weeks after mating). Make sure you feed your dog a premium, high-quality diet approved by your veterinarian during pregnancy. Discuss nutritional supplements and vitamins with your veterinarian before giving them to your dog. What do I do after the sixth week? After the sixth week of pregnancy, your dog should gradually increase her food intake; high energy, low fiber foods are recommended. As the fetuses increase in size, abdominal pressure increases and frequent small meals are advised. Diets containing high levels of omega-3 Docosahexaenoic Acid (DHA) have been shown to improve the health and development of puppies and should be considered. 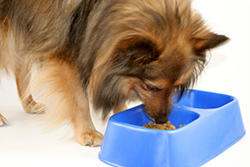 Discuss DHA-supplemented diets for your pregnant dog with your veterinarian. During the last three weeks of pregnancy, your dog's food intake should increase by up to one and a half times the normal level, by feeding smaller meals more frequently. How can I be certain my dog is pregnant? Early pregnancy detection in dogs can be extremely difficult. Unfortunately, we have no reliable laboratory tests. A veterinarian can perform a trans-abdominal palpation (feeling the abdomen for an enlarged uterus or for individual fetal swellings) at about three to four weeks after mating, but the results are variable. In some cases, results depend more upon the relaxation of the female dog than upon the experience of the doctor! "Abdominal ultrasound is currently the method of choice for pregnancy diagnosis." 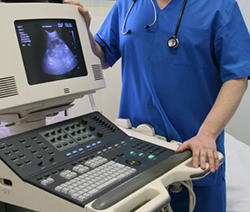 Abdominal ultrasound is currently the method of choice for pregnancy diagnosis. Depending on the equipment and patient, a positive diagnosis can be made as early as three weeks. Most scans performed after day 28 of the pregnancy are reliable. Due to positioning within the abdomen, it can be difficult to count the number of fetuses on an ultrasound with accuracy. An abdominal radiograph (x-ray) during the last two weeks of pregnancy, generally around week seven, is the most accurate method for determining litter size and should be performed on all pregnant dogs. Otherwise, you will not know when your female is finished having puppies and this could lead to puppies remaining trapped inside the mother. Should I change her routine as pregnancy advances?